Thai pickled cherry tofu anyone? When I got back from my last trip, one of the first things I did was try some of the Thai pickled cherries we made in July, and I wasn’t disappointed. The flavours are complex and interesting, and blend perfectly. The first thing that hits the tongue when you have one is the lemon grass, but that’s quickly followed by a strong cherry taste with a hint of hot spice, and the finish is pure lime. There’s something strangely satisfying about them, and they add an interesting accent to plate of (strong) cheese & crudités. We’ve been making our tofu with nigari, the traditional Japanese coagulant, but wanted to try something a bit different, so decided to make a batch of firm tofu using the brine from the pickled cherries – just to see what would happen. Slowly add your coagulant to hot soy milk until curds begin to form. If you made the soy milk yourself, remember to strain it through a cheesecloth first in order to remove the pulp, otherwise you will make very gritty tofu. Let the mixture sit for 15 minutes. Scoop the curds into a tofu mold lined with cheesecloth (or just pour everything in there). Tofu molds have holes that allow any liquid to run out, so you’ll want to put the mold in the sink first. Once most of the liquid has drained out of the curds, fold the cheesecloth over so that the tofu is completely wrapped. Put the lid on the mold and give the tofu a good squeeze over the sink. Put the tofu mold in a dish (to catch any water that comes out as you press the tofu). Put a weight on the lid, and let it sit for two hours. If you’re not going to use the tofu right away, submerge it in water and put it in the fridge. We used about a quart of soy milk fresh from the soy milk maker, and it took 5 tablespoons of brine to make it coagulate. That made about 8 oz of firm tofu. Using vinegar resulted in a somewhat less creamy texture than nigari does, and there was only the slightest a hint of all those great Thai cherry pickle flavours from the brine. Conclusion: there doesn’t seem to be much point in using a complex vinegar, but vinegar does give a good result. 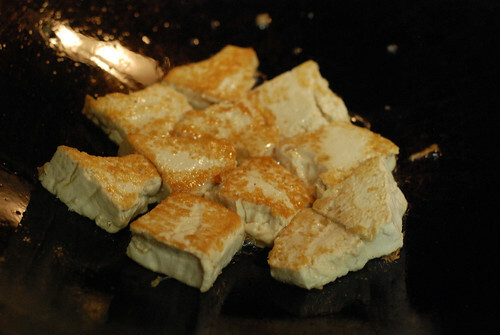 Even if you can’t find nigari, you can still make better-than-supermarket tofu at home using vinegar. The planet will benefit from your efforts by having a little less plastic in its landfills, and a little less CO2 in its air – and one thing’s for certain: if you take the time to make your tofu from scratch, you won’t be throwing it away. 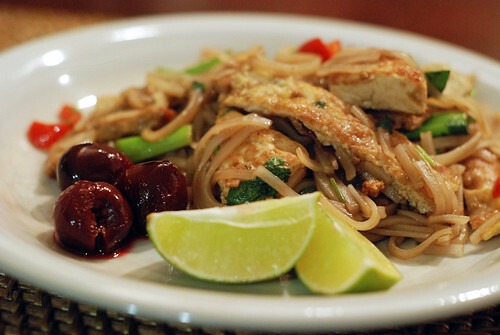 We used this particular batch of tofu to make Pad Thai, which we served with a few pickled cherries on the side. We used seitan instead of shrimp, though the meal wasn’t 100% vegetarian thanks to a couple of tablespoons of fish sauce. 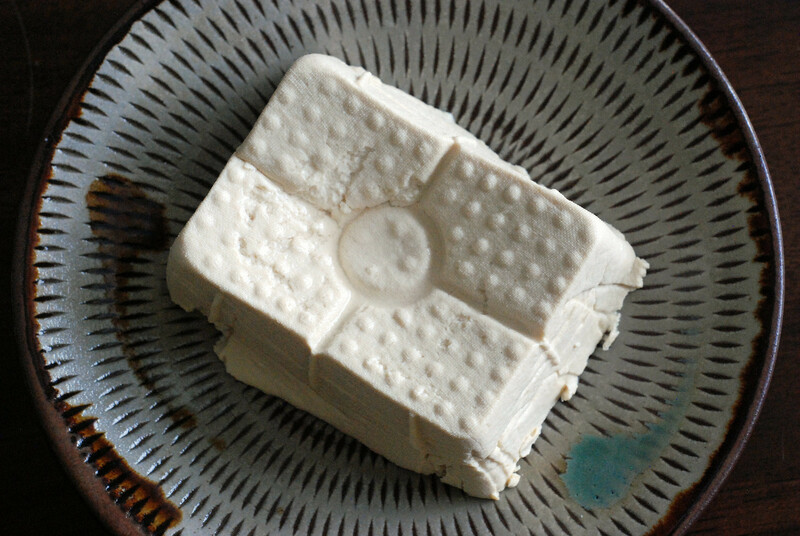 We never finish a block of tofu in one meal, so often have a bit of frozen tofu on hand. As I mentioned in a previous post, tofu keeps well in the freezer – and after you thaw it, squeeze the water out of it, and crumble it, you’re left with a chewy, porous protein that absorbs flavors well. One thing I’ve been meaning to try with it for a while is something similar to Thai fish cakes, and I made my first attempt at that this weekend. The result was a bit too bready, and the flavors were less strong than I like them, so this recipe isn’t quite ready for company yet – but it did make for a tasty, hearty lunch, and went well with sliced cucumber (tossed in rice vinegar, honey, red pepper & cilantro dressing with a pinch of salt). Toss tofu with fish sauce, grated ginger, and red curry paste. Add in the cilantro, Serrano pepper, scallion and eggs, and mix well. Mix in the breadcrumbs, 1 tablespoon at a time, until the mixture is sticky enough to form patties. Make 4 patties, and place them in the fridge for 10 minutes, to allow them to set. Cook patties until they are golden brown – about three minutes per side. Serve hot, with Thai sweet chili sauce.